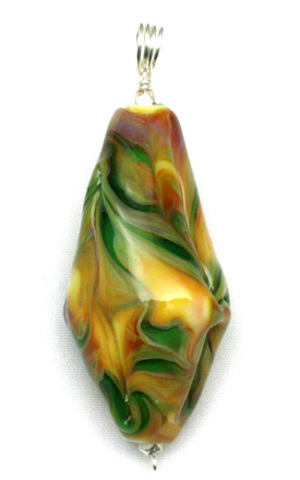 Originally a bicone, this lamp worked pendant bead is somewhat square as deep cuts were made into the molten glass on four sides of the bicone. Two high silver content glasses partially cover the white glass base. As the molten glass was manipulated with a pick and shaping paddle to produce the beautiful patterning, the white glass interacted with the silver and took on very soft amber-beige tones.